For quite a long time, poker players with eyes in green are unable to wear contact lenses. Now, we have brought you a good new! ① This is the most advanced invisible ink lens for green eyes. With the sophisticated sandwich technology and the technology of laser dyeing, this type of contact lenses has been on market. The biggest breakthrough of this type of lenses is that they will not change the color of your eyes under any circumstance. 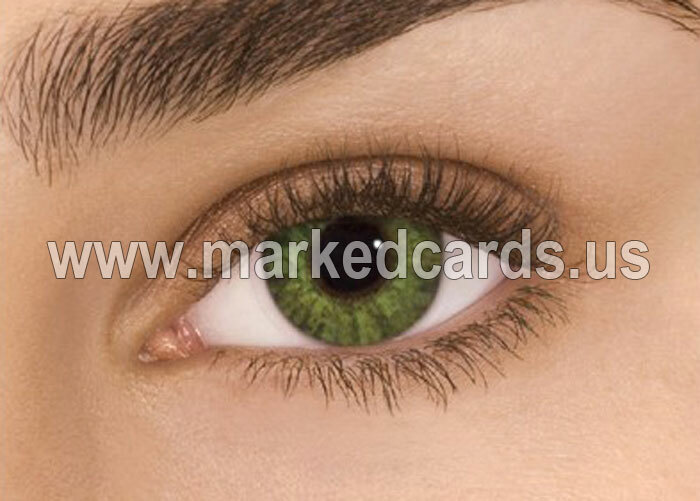 Lastly, the marked cards juice on the back of the card decks are easy and clear to be detected by your super luminous contact lenses. The price of this kind of lens may sound a bit expensive, but it will worth a try due to its magic power!!! ② The second type of the invisible ink contact lenses for green eyes are also on sale. Just like the newest ones, this type of lens may not change the color of your eyes, but it may change the original color of your pupils in different lights. Compared with the latest ones, this kind of contact lenses is lower in price and still excellent in effect and reliable in quality. This type is the most favorable one among the users. ③ The third type of invisible ink lens for green eyes has been developed. Unlike the first and the second type, this kind of lenses gets to change the original color of your eyes. But you may have no difficulty in spotting the marks on the back of the marked cards. This type of contact lenses is the lowest in price. This lens fit people who have green eyes. The color of your eyes will not be changed when you wear these contact lenses. Content: What is the price of ink and contact lenses? Content: Hello, I am interested in buying both infrared and ultraviolet contact lenses. Please let me know the pricing and the target at which you deliver. Thank you!